SFU SIAT students Henry Lo and Janice Ng work with professor Diane Gromala on their virtual reality game Farmooo, designed to help cancer patients manage their treatment pain. A virtual reality game that helps youths deal with cancer treatment —created by two Simon Fraser University students who spent time in hospital as youths, one as a cancer patient—is the latest pain management tool being developed in SFU's Pain Studies Lab. Henry Lo and Janice Ng, students in SFU Surrey's School of Interactive Arts and Technology, call the game Farmooo. It will be tested later this spring at B.C. Children's Hospital, where the students have been connecting with medical staff. Inspired by such games as Pain Squad, Farmville (a 2D farm simulation) and Gardening Mama, the pair tailored their game to the special needs of patients, who can conduct physical tasks in the virtual farm by using simple hand movements. The game is aimed at 12 to 18-year-olds and is run on a screen that plays at 70 frames per second to prevent dizziness. Lo was diagnosed with lymphoma while a Grade 11 student at Surrey's Fraser Heights Secondary School, after developing sudden difficulties with walking and breathing. He required immediate treatment, including chemotherapy. "I was quite suddenly needing to be in the hospital for extended periods, and realized that those can be long days for kids," says Lo, who hopes to develop games and software to speed up medical procedures and eliminate discomfort for patients and families. Ng, who also spent many hours in hospital with ear ailments, hopes to do similar work. 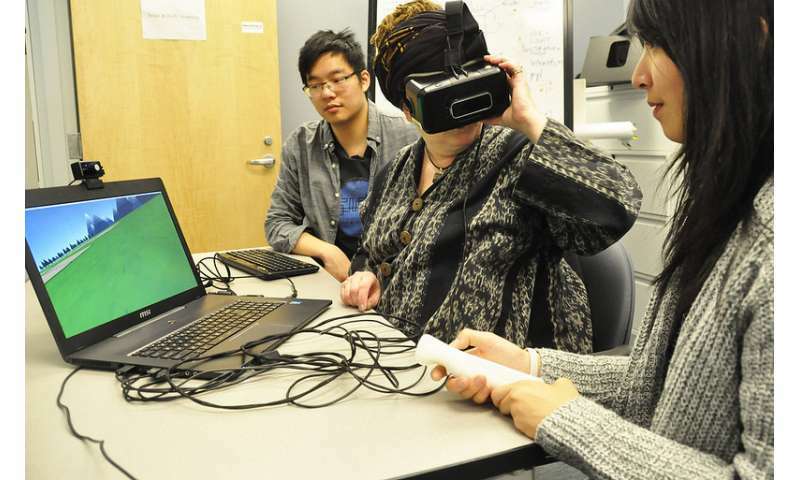 SIAT Professor Diane Gromala, the pair's supervisor, says the game is the latest in the lab's efforts to develop virtual reality (VR) approaches that address health care issues. "The team wanted to do something that offers benefits and meaningful values for the game and VR industry," says Gromala, who is also working with VR companies in Seattle and at Stanford University and designing VR games for kids at Boston Children's Hospital. "Through their research, the students discovered that most pain research has involved adults rather than teenagers and youths. As Henry learned first-hand, after harsh chemotherapy treatments, patients often experience pain and boredom when they are stuck in bed, where discomfort can be more extreme at a younger age."